by Chris Woodford. Last updated: May 4, 2018. Microscopes let us peer inside invisible worlds our eyes could never see, telescopes take us far beyond the Earth to the stars and planets of the night sky, movie projectors throw enormous images onto screens, and lighthouses cast reassuring beams of light far across the ocean. Amazing curves of glass or plastic called lenses make all these things possible. 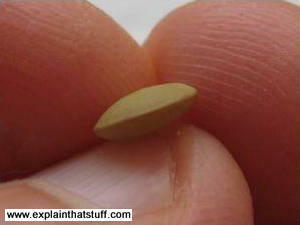 Let's take a closer look at what they are and how they work! Photo: Lenses in the headlamps of this car focus beams of light down onto the road so you can see where you're going. 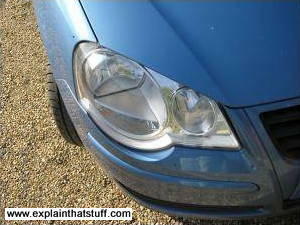 Some car headlights use Fresnel lenses to make powerful beams, just like lighthouses! A lens is a transparent piece of glass or plastic with at least one curved surface. It gets its name from the Latin word for "lentil" (a type of pulse used in cooking), but don't let that confuse you. There's no real reason for this other than that the most common kind of lens (called a convex lens) looks very much like a lentil! Photo: Lentils gave lenses their name. Convex lenses bulge out in the middle like lentils, while concave lenses "cave in" in the middle and bulge out at the edges. A lens works by refraction: it bends light rays as they pass through it so they change direction. 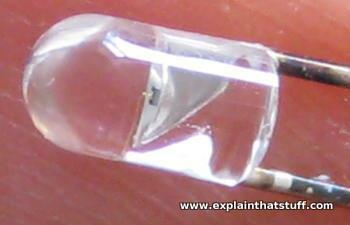 (You can read a full explanation of why this happens in our article on light.) That means the rays seem to come from a point that's closer or further away from where they actually originate—and that's what makes objects seen through a lens seem either bigger or smaller than they really are. There are two main types of lenses, known as convex (or converging) and concave (or diverging). In a convex lens (sometimes called a positive lens), the glass (or plastic) surfaces bulge outwards in the center giving the classic lentil-like shape. A convex lens is also called a converging lens because it makes parallel light rays passing through it bend inward and meet (converge) at a spot just beyond the lens known as the focal point. Photo: A convex lens makes parallel light rays converge (come together) at the focal point or focus. The distance from the center of the lens to the focal point is the focal length of the lens. The focal point is on the opposite side of the lens to that from which the light rays originate. Convex lenses are used in things like telescopes and binoculars to bring distant light rays to a focus in your eyes. Photo: A concave lens makes parallel light rays diverge (spread out) so that they appear to come from a point behind the lens—the focal point. The distance from the center of the lens to the focal point is, again, the focal length of the lens. However, in this case, since the light rays don't really come from here, we call it a virtual focal point. Concave lenses are used in things like TV projectors to make light rays spread out into the distance. In a flashlight, it's easier to do this job with a mirror, which usually weighs much less than a lens and is cheaper to manufacture as well. It's possible to make lenses that behave in more complex ways by combining convex and concave lenses. A lens that uses two or more simpler lenses in this way is called a compound lens. How do you measure the power of a lens? You'll find focal lengths written either in ordinary units of length (such as centimeters, millimeters, or inches) or in special optical units called diopters. The diopter measurement of a lens is the reciprocal of the focal length in meters (one divided by the focal length), so 1 diopter = 1 m, 2 diopters = 0.5 m, 3 diopters = 0.33 meters, and so on. Eyeglass prescriptions from opticians typically show the strength of the corrective lenses you need in diopters. 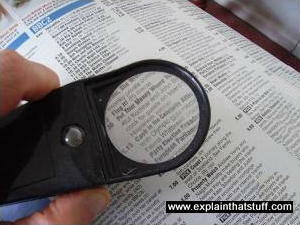 Photo: This magnifying glass uses a single convex lens made from plastic. Until plastics became common in the 20th century, virtually all lenses were made by grinding solid pieces of glass into different shapes. Convex lenses were made by using a concave-shaped grinding tool (and vice-versa), and then the roughly shaped lens was polished to make its final shape. The ordinary glass we use in windows and crockery isn't good enough to use for lenses, because it contains air bubbles and other imperfections. These cause light rays to divert from their correct path, making a fuzzy image or one that makes different colors of light behave in different ways (problems that optical scientists refer to as aberrations). Instead, lenses are made using a more refined material known as optical glass. For eyeglasses, many people now prefer plastic lenses because they're much lighter and safer than optical glass. Plastic lenses can be molded to shape, instead of being ground, so they can be made in huge quantities far more cheaply than glass lenses. Although ordinary plastic scratches easily, it can be coated with a thin layer of a protective material such as diamond-like carbon (DLC) to reduce the risk of damage. Some optical lenses are also coated with thin plastic to reduce annoying reflections; you can read how these anti-reflective coatings work in our article on thin-film interference. Photo: I made this water lens by cutting a small piece of plastic from a grocery bag and laying it over a newspaper. I dropped the water on, very slowly and carefully, using a teaspoon. Do this in your kitchen or bathroom to avoid making a mess. Take an old newspaper or magazine no-one wants anymore. 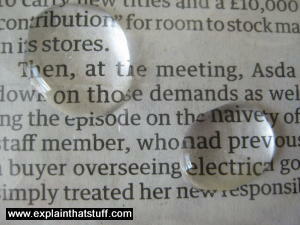 Lay a small piece of cellophane, cling film, or clear plastic on top of the newspaper. You don't need much—maybe a piece half the size of a paperback book cover. Using an eye-dropper, pipette, syringe, teaspoon, or even the tip of your pinkie, place a single, small drop of water on top of the cling film. Look at the newsprint and you should be able to see that the water drop (which has a curved upper edge and a flat lower edge) magnifies the words. Well done, you just made a lens! What happens if you make the water drop bigger or smaller? What if you lift the plastic away from the paper and move your lens nearer or further from the print? What other cunning things can you do to change the way your lens works? Like all great scientists, take the chance to play around and experiment. What are lenses used for? Lenses are everywhere in the world around us—in everything from car headlamps and flashlights to the LED lights used in electronic instrument panels. Our eyes contain probably the most amazing lenses of all. Think what happens when you look at the world around you. One minute you're staring at the ground in front of your feet. Seconds later, you hear an airplane screaming past, turn your head, and watch it fly by. Do this trick with a pair of binoculars and you'll find it takes you quite a while to adjust the focus from near-sight (looking at the ground) to far (watching the plane). Try it with the naked eye and you won't even notice what you're doing. That's because your eyes have flexible lenses, controlled by tiny muscles, that can bulge in and out, changing shape instantly to focus on anything from the prints on your finger to the surface of the Moon. How amazing is that? 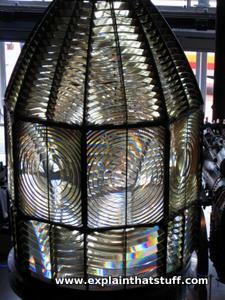 Photos: Lighthouses don't use huge and heavy lenses: instead, they rely on Fresnel lenses (ones with a stepped surface pattern of concentric rings) and prisms, like the one in this exhibit at Think Tank, the science museum in Birmingham, England. Read how they work in our article on Fresnel lenses. We all have lenses in our eyes, but many of us balance extra ones on the end of our noses to correct long and short sight: more glass and plastic lenses are used for eyeglasses and contact lenses than for any other purpose. There are all kinds of eyeglass lenses, including light-sensitive photochromic ones that darken in sunlight and double-up as sunglasses. You'll also find lenses in binoculars (which use two or three lenses in each of the cylinders serving your eyes) and telescopes, though not all microscopes use them. Ordinary (optical) microscopes use a series of glass lenses to magnify tiny objects, while super-powerful electron microscopes use electromagnets to bend electron beams that help us see in even more detail. Movie projectors and projection televisions use lenses to convert small movie pictures into giant images that lots of people can view at once. Cameras work the opposite way, catching light rays from a distance and bringing them to focus on chemically treated plastic film or light-sensitive electronic chips called CCDs. You can even find lenses built into magazine and book covers to make images change as you shift your head from side to side; this cunning trick is called lenticular printing—but it really just means "printing with built-in lenses." Optics by Eugene Hecht. Addison-Wesley, 2016. A definitive undergraduate textbook on light. Photographic Lenses: Photographer's Guide to Characteristics, Quality, Use, and Design by Ernst Wildi. Amherst Media, 2001. Although aimed at photographers, this book gives a good overview of different types of lenses, how they differ, and what you can use them for. Leica Lens Practice: Choosing and Using Leica Lenses by Dennis Laney. Kogan Page, 2006. Another photographic book that will be of more general interest. Includes illustrated explanations of how different sized lenses produce different photographic effects. Everything You Need to Know About Lenses and Light by Baby Professor. Speedy Publishing, 2017. Ages 7–10. Light by David Burnie. Dorling Kindersley, 1998. An introduction to the science, technology, and history of light from the popular DK Eyewitness series. For ages 9–12. The problems with lenses, and the 19th-century solution: This article from Cambridge University's Whipple Museum explains why lenses distort images and how inventors got around the problem to make the first microscopes. Who Made That Contact Lens? by Daniel Engber. The New York Times. April 13, 2014. The idea of using artificial (contact) lenses instead of eyeglasses dates back to at least the 19th century. Optics for Kids: Lots of good educational material from the Optical Society of America. The MusEYEum: A museum in London, England run by the College of Optometrists. The website includes quite a few online exhibits that are worth a browse.